It is not easy going through the holidays when I thought I would get to enjoy it while pregnant and sharing this news with family. I had counted out the weeks and realized that the timing would work out for us to share the news with friends right after the New Year. And my mind had already fast-forwarded to the next Christmas where we would celebrate with ornaments saying “Baby’s first Christmas” (times two). So now, as I continue to recover from this abrupt change in plans, I’ve tried to focus on other things that I can still appreciate and be happy about as Christmas approaches. 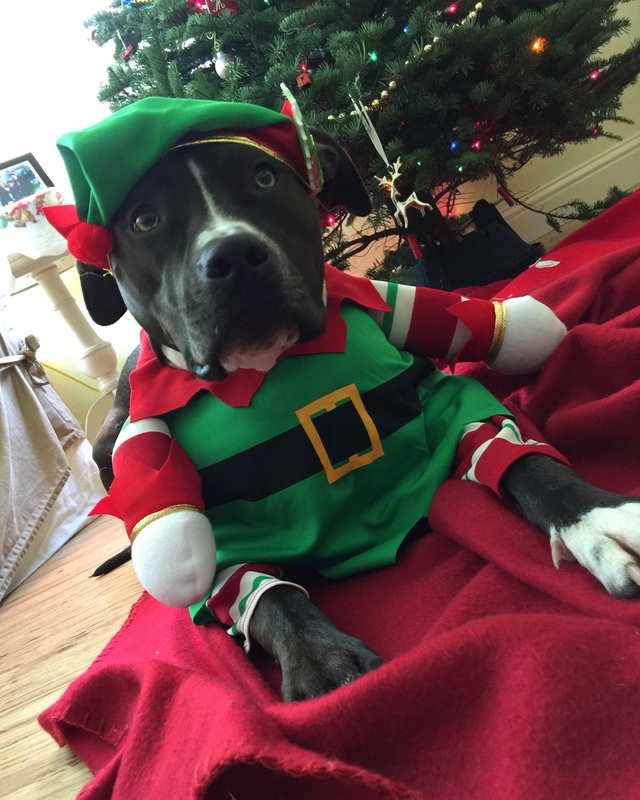 One of which is my new found hobby of dressing up my dog for the holidays and attempting to take photographs. I was very successful at this endeavor when I dressed her up as a skunk for Halloween, so I did not hold back when I purchased three different Christmas outfits. I learned a couple of important lessons this weekend: My dog has a two-wardrobe change limit and she is the one directing the photo session, not me. She shall sit or lie down where she pleases and any desired location change on my part requires many treats. I probably took over 150 photos and ended up with four that I could use for our holiday card this year. Not bad. I was very pleased that these four ended up with the Christmas tree in the background (kind of) and that her costumes remained in tact and were not torn to pieces. The photo shoot was a great distraction for me this weekend while trying to relieve myself from sadness and disappointment. She gave me these looks like she was perplexed but willing to tolerate it; as if she sensed somehow that I needed this silliness to happen. So she did and she made me happy.